About The Red Cloud chief. Red Cloud, Webster Co., Neb. -v. 51, no. 47 (Nov. 22, 1923). Began with July 3, 1873 issue. Description based on: Vol. 1, no. 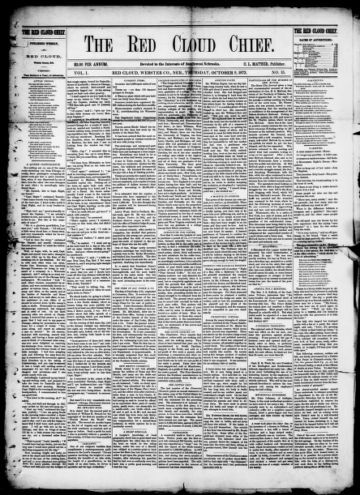 15 (Oct. 9, 1873). The city of Red Cloud, Nebraska, is notable both for its namesake and for its well-known resident, the author Willa Cather. The city, situated in Webster County, was named for the Oglala Sioux Chief Red Cloud, who led a successful offensive against the U. S. Army in 1866 and signed the Treaty of Fort Laramie in 1868. The city's first newspaper, The Red Cloud Chief (1873-1923) focused on the development of this heavily rural community. Founding publisher and editor, C. L. Mather, sold its operation in 1875 to Mark Warner, who eventually sold it to M. L. Thomas. Thomas ran the paper during a deadly 1879 summer storm. "The rain fell in torrents, and the wind blew a hurricane, eddying and whirling about, blowing down some buildings and unroofing others. A great many buildings were leveled to the ground, and the only way their occupants were saved was by flying to their cellars," said one account. The newspaper's offices were heavily damaged. The Chief published some early contributions from Willa Cather, who had spent much of her childhood there since age ten, having moved from Virginia in 1883. Cather's childhood memories influenced her fiction writing. The city's official website states that "Cather has immortalized this small community and Webster County in her writings. The Red Cloud of her youth is the setting of many of her works . . . [it] appears as Hanover, Moonstone, Black Hawk, Frankfort, Sweetwater, and Haverford." While initially the paper had a Republican stance, a later editor and owner, A. B. McArthur, boasted of his paper as "the only Democratic paper in Webster County." The paper's name was featured in elaborate bold capitals across an illustration of a wilderness panorama of trees and mountains in the background, a covered wagon on the left, and empty railroad tracks on the right. Between these, sitting on a log and gazing into the distance with a long rifle across his knees, sat a Native American who looked better placed in one of James Fenimore Cooper's tales than anything like the historical person of Chief Red Cloud. McArthur's motto was "a newspaper that gives the news fifty-two weeks each year for $1.50." The Red Cloud Chief was published on Thursdays. Local news and advertisements appeared on the front page.